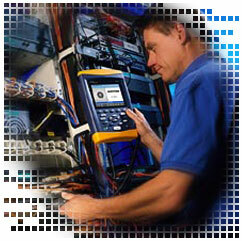 Fluke Networks software and hardware products provide professionals with the tools and knowledge needed for the installation, monitoring, and maintenance of local and wide area networks, and the underlying fiber and copper cable infrastructure. Fluke Networks products provide network installers, owners, and maintainers with superior vision, combining speed, accuracy, and ease of use to ensure maximum network performance and the fast resolution of problems. LinkWare gives you the ability to manage test results data from multiple testers with one single software application. It makes project setup much simpler for Fluke Networks' entire line of cable testers by helping you quickly organize, edit, view, print, save or archive test results by job site, customer, campus building and more. OptiFiber is the first tool specifically designed to keep LAN installers on top of the latest requirements for testing and certifying fiber networks. OptiFiber integrates insertion loss and fiber length measurement, OTDR analysis and fiber connector end-face imaging to provide a higher tier of fiber certification and diagnostics. The companion LinkWare PC software documents, reports and manages all test data. OptiFiber enables contractors and private network owners of all experience levels to certify fiber to industry and customer specifications, troubleshoot short-haul connection-rich links and thoroughly document their results. Look to CertiFiber to test more fibers in less time. With its one-button "Autotest", CertiFiber allows you to measure fiber length and optical loss on two fibers at two wavelengths, compares the results to the selected industry standard and provides an instant PASS or FAIL indication. Fluke Networks FT120 and FT140 Fiber Viewers are handheld microscopes used to inspect the ends of fiber optic connections. The Fiber Viewers ensure your termination is smooth, clean and ready for optical transmission. The compact SimpliFiber sources and meter are durable and rugged, featuring textured, impact-resistant covers and an ergonomic shape for a comfortable and secure grip. An integrated cover protects the fiber ports. Long-battery life assures hours of trouble-free operation. Whether you require basic fiber link testing capabilities or more advanced documentation and report generation, Fluke Networks' FTI Basic Package and the FTI Pro Package offer you the rugged quality fiber test tools to meet all of your fiber test needs. DTX Fiber Test Kit allow one to use a DTX CableAnalyzer to measure optical power and insertion loss in fiber optic cabling. The flagship product of the MicroTools line is the MicroScanner Pro. This powerful tool is designed to prevent and solve cable and wire installation problems allowing you to confirm continuity, wiring configuration and the location of cable faults, saving you time and money at every installation.